The model of female leader has morphed from Iron Lady to soft power. And the controversy over Rice stems in part from the fact that she does not fit comfortably into this model of collegial, nurturing, division-healing woman. The adjectives used to describe her are fraught with sexist undertones. Blunt. Sharp-elbowed. Driven. Egotistical. Some of these terms come from her friends. No one thinks she would win Miss Congeniality. It goes too far to say pure sexism, but I think gender plays a role, however subconscious. My analysis assumes that the Rice critique does not stem solely from her comments on a single Sunday morning of talk-show rounds. Something more is going on here: A touch of chummy old-boy (and old-girl, for that matter) networkism in support of Senate colleague John Kerry. A residue of bristling over previous encounters (see Rice’s tart 2008 comments about then-GOP presidential nominee John McCain). Republicans of course hotly reject any suggestion of bias in their move against Rice, and they have a handy exhibit to offer in their defense: Condoleezza Rice, whom the party not so long ago embraced as the first-ever black woman to serve as secretary of state. However, this whole episode is serving as a stark reminder that the Republican Party's lack of diversity is not just a problem on Election Day, when its disproportionately white-male base left it falling short at the polls, but is in fact exacting an ongoing, day-to-day toll on its effectiveness in Washington. 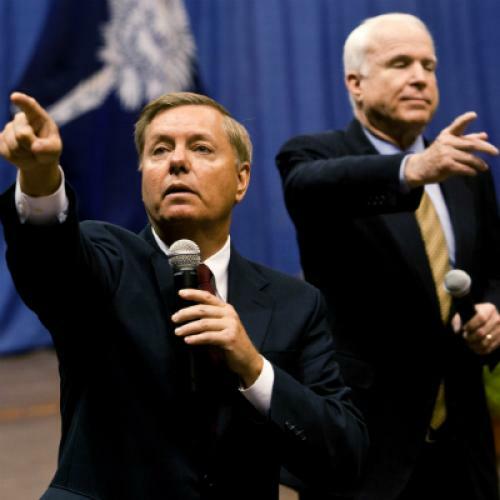 There is no way of knowing just what is driving John McCain and Lindsey Graham to such heights against Rice -- surely, much of it has to do less with her identity than with McCain's resentment of Obama, Graham's fears of a 2014 primary challenge and the general air of conspiratorial-minded outrage that Fox News and others have managed to whip up around Benghazi. But the image of an indisputably accomplished senior diplomat being relentlessly hounded by two angry white Sun-Belt senators is presumably not the one that Republicans would ideally have dominating the scene as they start trying to broaden their appeal. It is surely no accident that Graham and McCain have been joined in their mission by Kelly Ayotte of New Hampshire, and that they got crucial backup this week from Susan Collins -- Ayotte and Collins are, with Alaska's Lisa Murkowski, the only Republican women staying on from the current Senate (and are also, as it happens, the only New England Republicans left in the entire U.S. Congress.) Ayotte, in particular, has often been willing to step out on her colleagues' behalf to defend them against the charge of being unenlightened in matters involving women. But there's a limit to the extent to which the party will be able to rely on a tiny handful of trusty non-white-males to serve this role. The picture is hardly better in the House, where the party is left with a single black member and has just named a slate of committee chairmen consisting entirely of white men; when administration officials are inevitably summoned to hearings in the next four years, whether on Benghazi or Solyndra or whatever it may be, it will be a Republican white guy staring from behind the gavel or letting rip at press conference microphones. Whatever the merits of the matter at hand, the contrast will be further confirmed, of the party of white men of advanced years facing off against a younger, more diverse tableau. On the eve of Election Day, I attended a Romney rally at an airplane hangar in Columbus, Ohio. I had attended my share of Romney events during the year but I was still unprepared for the scene: thousands of cheering people, of whom, in a city that is more than 25 percent black, virtually every single face was white. A day later, we found out that this homogeneity had helped cost the Republicans their second straight presidential election loss and helped foil their golden chance to regain control of the Senate. Now, we're seeing the cost in the regular churn of governing. To the extent that Republicans in Washington have sincerely-held misgivings about Susan Rice, Eric Holder, Kathleen Sebelius, Sonia Sotomayor or whomever else, those misgivings would be more persuasively stated if they weren't coming from a row of men who, in the immortal words of former Ohio Republican senator George Voinovich, "get on TV and go 'errrr, errrrr.'"